Interested in hiking local Princeton trails and giving back to the Princeton outdoors community? 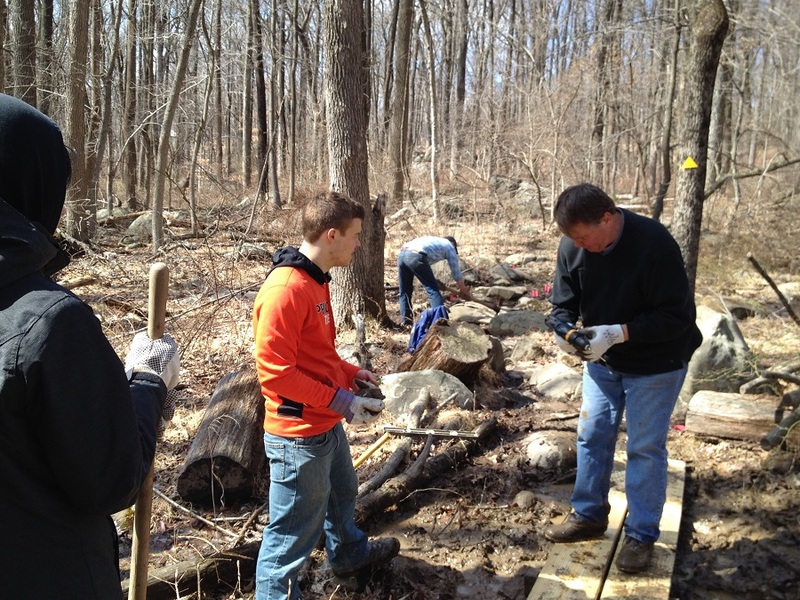 Join OA for a nature hike and trail maintenance project! We partner up with FOPOS (Friends of Princeton Open Spaces) to tackle a section of trail in full-force. Typical projects include movingstones, leveling sections, clearing vegetation, and lining paths. You'll also learn about wildlife and invasive species along the way! Be sure to bring shoes you are comfortable hiking and working in! Join OA for a day full of fun, FREE, outdoor activities! Explore some of the hidden natural gems that are right in the Princeton area. Read more about Farming with OA! Six members of the OA community, led by leader-in-training Olivia Trase, joined FOPOS (Friends of Princeton Open Spaces) for a day of trail maintenance at Mountain Lakes preserve. The group built a boardwalk over a very muddy section at the start of the yellow trail from the Cherry Hill parking lot. When Suzi Rees lost her hearing six years ago, she became curious to explore how she could adapt communication methods used in rock climbing and find new ways of working with her climbing partner that made their lives easier. Here, she shares her tips for communicating with deaf climbers and what the future looks like for deaf climbing. Peak Potential is all about helping kids achieve more than they thought was possible. Using the OA Climbing Wall and a team approach volunteers help children with disabilities reach new heights (literally). All children require a belayer and many also require a climber with an additional belayer. The climber encourages the child and may help her place hands and feet on holds as they climb. OA is looking for students who would be interested in working with children at the Wall on a weekly basis throughout the semester. No previous climbing experience is required, although you will need to go through a belay training and orientation in order to work with children with disabilities. OA Leaders volunteer their time to help incoming freshmen learn about Princeton, to teach other Princeton students leadership skills and reach out to the surrounding community utilizing their special skills to help others. Through ourt programs such as Peak Potential at the OA Climbing Wall which providews indoor rock climbing for children with disabilities to our Leave No Trace Pogram that teaches sustainable outdoor skills to local school children, OA provides students with the opportunity to use leadership in service. The Outdoor Action Peak Potential Climbing program offers children with disabilities the opportunity to expand their horizons through climbing at the Outdoor Action Climbing Wall at Princeton University. Here is one of the Peak Potential volunteers helping one of the children "reach their summit."